Mouse antiHuman CD8 antibody, clone 4B11 (MCA1817) used for the identification of CD8 expressing cells in Buruli ulcer secondary lesions by immunohistochemistry on formalin fixed, paraffin embedded tissue sections. Presence of B-cell clusters in the secondary lesions. A: Band of CD20 positive B-cells in sections of ulcer 2 of patient 1. B–E: serial sections of nodule 3 of patient 2 with a small dense cluster of CD20 positive B-cells (B) surrounded by CD14 positive macrophages/monocytes (C) and few interspersed CD3 positive T-cells (D) from which the majority was CD8 negative (E). Higher magnification (F–I) revealed a very dense package of the B-cells. PLoS Negl Trop Dis 5(8): e1252. 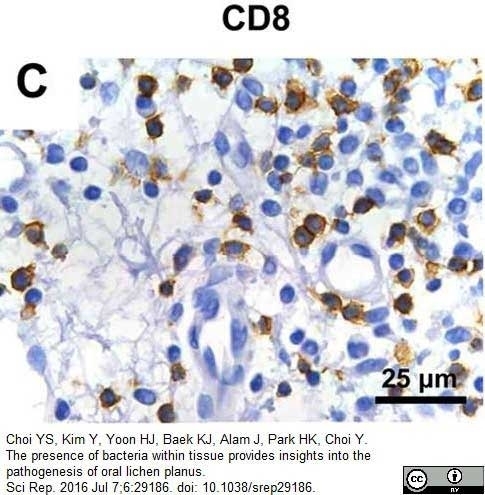 Mouse anti Human CD8 antibody, clone 4B11 (MCA1817) used for the detection of CD8 expressing lymphocytes in OLP tissue by immunohistochemistry on formalin fixed, paraffin embedded tissue sections. Oral lichen planus tissue stained for CD8 expressing lymphocytes. From: Choi YS, Kim Y, Yoon HJ, Baek KJ, Alam J, Park HK, Choi Y. The presence of bacteria within tissue provides insights into the pathogenesis of oral lichen planus. Sci Rep. 2016 Jul 7;6:29186. 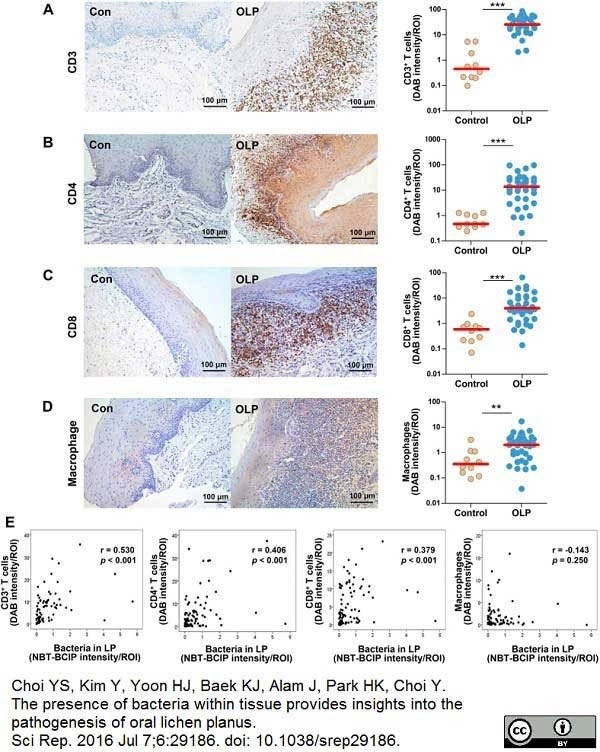 Presence of bacteria within epithelial cells CD3+, CD8+ and CD8− lymphocytes in OLP tissues. Sections of OLP tissues (n = 4) were hybridized in situ for 16S rRNA and then immunostained for CD8 (H). 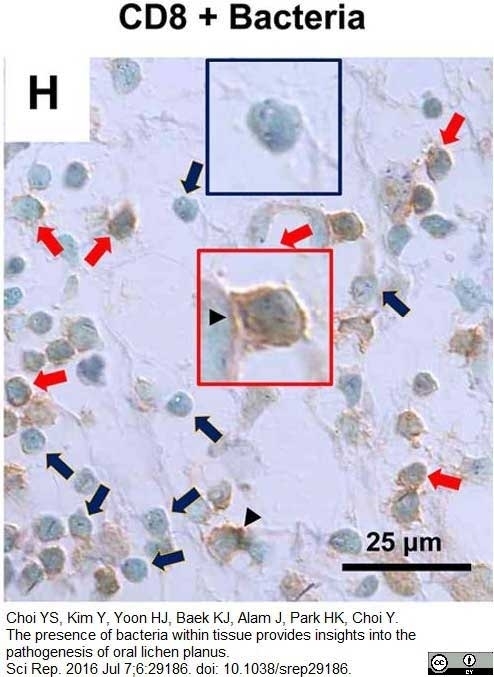 Red arrows indicate bacteria detected within CD8+ cells; blue arrows indicate bacteria detected within CD8− lymphocytes; arrowheads indicate an immunologic synapse-like structure. Increased infiltration of T cells correlated with the levels of bacteria in the lamina propria in OLP. 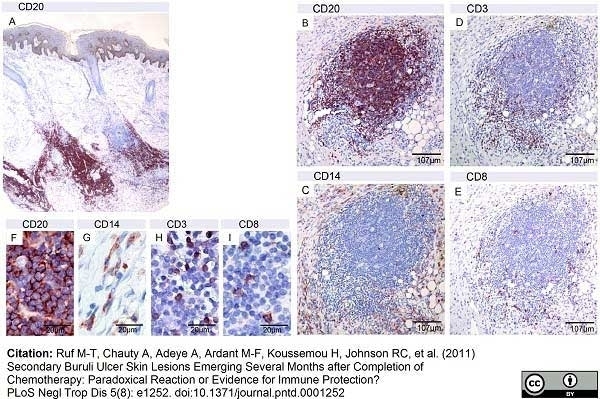 (A–D) Representative immunohistochemical detection of CD3+ cells (A), CD4+ cells (B), CD8+ cells (C), and macrophages (D) in control (n = 10) and OLP (n = 36) tissues. Each symbol in the graphs represents the mean intensity of stained signals per ROI measured in four randomly chosen fields (**P <0.01; ***P <0.001 by Mann-Whitney U test). (D) Correlation plots between the levels of bacteria in the lamina propria and the levels of CD3+ cells, CD4+ cells, CD8+ cells, or macrophages (r and P by Spearman's rank correlation test). Mouse anti Human CD8 antibody, clone 4B11 recognizes the human CD8 cell surface antigen, a ~32 kDa glycoprotein expressed by the cytotoxic/suppressor subset of T-cells and weakly by NK cells. Mouse anti Human CD8 antibody, clone 4B11 was raised based on an earlier successful strategy used to generate rabbit polyclonal antibodies against human CD8 employing the same immunizing peptide (Mason et al. 1992). Mouse anti Human CD8 antibody, clone 4B11 has been reported as being suitable for use in Western blotting (Williamson et al. 1998) . Synthetic peptide derived from the carboxy terminal region of the human CD8 alpha chain coupled to a N-terminal cysteine, with the sequence C-KSDGKPSLSARYV. The peptide was coupled to bovine serum albumin and keyhole limpet hemocyanin. 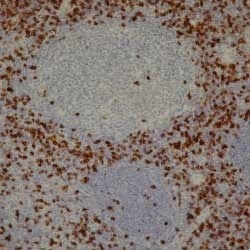 Spleen cells from immunised mice were fused with cells of a mouse p3-NS1-Ag4-1 myeloma cell line. Tris/EDTA buffer pH 8.0 is recommended for this purpose. Williamson, S.L. et al. (1998) New monoclonal antibodies to the T cell antigens CD4 and CD8. Production and characterization in formalin-fixed paraffin-embedded tissue. Am J Pathol. 152 (6): 1421-6. Freysdottir, J. et al. (2007) Oral biopsies from patients with orofacial granulomatosis with histology resembling Crohn's disease have a prominent Th1 environment. Inflamm Bowel Dis. 13 (4): 439-45. Rees, L.E. et al. (2006) Smoking influences the immunological architecture of the human larynx. Int. J. Oral. Biol. 34: 131-135. Kim, Y.C. et al. (2010) Presence of Porphyromonas gingivalis and plasma cell dominance in gingival tissues with periodontitis. Ruf, M.T. et al. (2011) Secondary buruli ulcer skin lesions emerging several months after completion of chemotherapy: paradoxical reaction or evidence for immune protection? PLoS Negl Trop Dis. 5: e1252. Weber, B. et al. (2016) Distinct interferon-gamma and interleukin-9 expression in cutaneous and oral lichen planus. Choi, Y.S. et al. (2016) The presence of bacteria within tissue provides insights into the pathogenesis of oral lichen planus. Mason, D.Y. et al. (1992) Immunohistological detection of human cytotoxic/suppressor T cells using antibodies to a CD8 peptide sequence. J Clin Pathol. 45 (12): 1084-8. Brunati, S. et al. (1987) Production and characterization of a rabbit antiserum to the mouse CD8 antigenic complex by immunization with a synthetic peptide. J Immunol Methods. 96 (1): 97-105.